May 4, 2018, Thekchen Chöling, Dharamsala, HP, India – When His Holiness the Dalai Lama reached the Tsuglagkhang this morning, he paid his respects, greeted the various Russian scientists and took his seat. Telo Rinpoche lost no time in introducing Dr Namdol Lhamo of the Men-tsee-khang, the Tibetan Medical and Astro-science Institute, who had been invited to make a presentation on Understanding the World in the context of the Tibetan medical tradition. She began by explaining that a human being is an aggregate of six elements: earth, water, fire, wind and space. His Holiness suggested that it can help people unfamiliar with the system to understand it better if it is made clear that actual fire is not involved. The word fire represents heat, just as wind implies energy and movement. Dr Lhamo added that the sixth constituent is consciousness. Taking up the question that His Holiness raised yesterday, she clarified that the presence of sperm and ovum are not sufficient for the conception of a foetus to take place; consciousness is also required. In addition, it is karma that brings them together. If one of these constituents is absent, conception will not take place, which is what happens in 20% of cases. Dr Lhamo went on to refer to the fish, turtle and pig stages of foetal development that occurs over 38 weeks. She pointed out that in the Tibetan medical explanation the skeletal structure is derived from the sperm, while the muscles and other soft tissue are derived from the ovum. She mentioned that at the 24th week the solid and vessel organs are completely developed and the foetus can experience pleasure and pain. By the 25th week it is capable of breath and by the 26th week, being capable of clear thought, it also has the ability to recall past lives. Dr Lhamo stated that a Tibetan physician examines three principal energies: wind, characterised as light, moving energy; bile, which is associated with heat and phlegm, the character of which is cold, moist and heavy. When there is an imbalance among these energies the patient is unwell. Introducing the black and white vital channels, she explained that while the black category includes veins, arteries, blood vessels and so forth, the white category refers to the brain and nervous system. She concluded that maintaining health requires an individual to avoid an unwholesome diet and an unwholesome lifestyle. This is because a predisposition to become unwell is always present and can be precipitated by secondary factors. She recommended taking a holistic view of the human being as an entity of mind and body. The moment Dr Lhamo was finished, the Moderator Prof Anokhin wanted to know how it is known that a foetus recalls previous lives in the 26th week of its development. She told him it was a result of the wind energy’s having fully developed at that point. His Holiness suggested that what may be implied is that the power of memory in general engages at that point. He added that once the child is born it may have such memories at an early age, but these vanish as the brain develops further as it grows up. 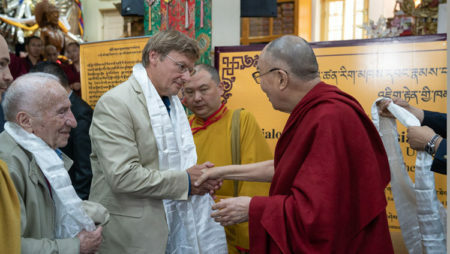 After a short break for tea, Prof Victoria Lysenko, a Russian specialist in Indian and Buddhist philosophy, who His Holiness has met before, asked if it is true that he feels Buddhist science correlates with modern science, but Buddhist philosophy and meditation practice are of concern only to Buddhists. “I usually make a distinction,” His Holiness replied, “between Buddhist science and Buddhist religious practice. Religious practice is a private matter, but the insights of Buddhist science should be available to everyone. Buddhist science as exemplified by the Nalanda Tradition is a result of logical investigation. In Dharmakirti’s explanation of the four noble truths in the second chapter of his ‘Commentary on Valid Cognition’ he mentions that even after you have established a valid inference it is still necessary to develop experience. “As I mentioned yesterday, the Buddha’s teaching is founded on an understanding of reality. The theory of selflessness and the explanation that self is designated on the basis of body and mind imply that if the mind changes the self changes. “Nagarjuna stated that what the Buddha taught is based on the two truths, the conventional truth of appearances and the truth of ultimate reality. On the basis of understanding the path is developed. I don’t talk about a dialogue between science and Buddhism, but of a conversation between modern science and Buddhist science. We discuss what is evident to everyone. Ninety year old Prof David Dubrovsky, a philosopher of science, who also attended the first Dialogue between Russian and Buddhist Scholars last year, asked what His Holiness knows of new methods for studying the brain like narrow band imaging and his view of technological convergence. His Holiness told him that he has met some scientists who imagine that it may eventually be possible to generate consciousness through technological development. In other words, to create something like a sentient being with artificial intelligence. Prof Dubrovsky told him that he seeks to show that the Buddhist description of the experience of consciousness does not contradict science—they share a common conceptual platform. However, consciousness has a subjective aspect and subjective reality is a problem for science. He quoted approvingly from ‘Universe in a Single Atom’ His Holiness’s suggestion that there needs to be a way of combining objective lived experience with subjective experience. An ability to control our thoughts allows an ability to control our own brains. Dubrovsky declared that he doubts the assertion that the human mind is essentially pure, that it essentially includes no negative aspects. However, he conceded there is an urgent need to learn how to transform the human mind and that it is important to take an optimistic view of this. In his response His Holiness observed, “Everyone wants to live a happy life. Indeed every human being has a right to live a happy life. But there is a difference between happiness on a mental level and happiness on a physical or sensory level. At present our education systems are inadequate because they tend to take account only of material or sensory goals. What distinguishes human beings from animals is our mental experience, but this faculty can be misused. Monkeys may fight among themselves, but they don’t mobilise thousands to kill each other like people do. “Therefore our education systems should teach more about the workings of our minds and emotions, and they should do so in the context of secular values. People’s wish to live in peace relates to their minds. That’s why I’m fully committed to making the psychological knowledge of ancient India more available. I believe that India can combine modern and ancient knowledge for the general benefit. “We need a scientific approach to the promotion of warm-heartedness. And we need to convince people of the need to tackle anger. This work may not bring quick results and I may not live to see them, but those in their 30s now may see the emergence of a more peaceful human population. “What’s more, whereas in the early days the development of nuclear weapons excited some scientists, because of a popular yearning for genuine peace, we now need to find ways of eliminating them. Scientists can certainly contribute to creating a better more compassionate world and generally people will pay attention to what they have to say. “This has been the second of our meetings—I hope we may all meet again and that one day such a gathering may take place in Moscow.” The warm applause that greeted this statement indicated that the hope is widely shared. His Holiness left the temple for his residence and his Russian guests joined him for lunch.